A preparation generally made with fruit and/or vegetables, vinegar, herbs, and spices that provides a sweet and sour taste with flavors ranging from mild to very hot and spicy. Traditionally, it is Indian in origin and has a consistency ranging from chunky to smooth. 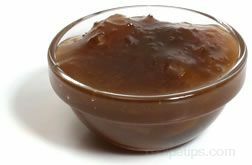 Chutney is used as a condiment, an appetizer, an salad dressing ingredient, or served with savory meat dishes, such as grilled pork or poultry. It can also be served as a topping for a variety of cheeses adding a nice flavor enhancer to the combination. Mango and plum are two of the popular fruit varieties or a mixture of ingredients such as apple, tomato, and onion are also popular. However, there are numerous variations of chutney made from many different foods, such as beets, cranberries, chestnuts, raisins, pears, apricots, and many other fruits or vegetables.